- If you like you can spray a little silver paint on the twig first to make it look even more spooky. 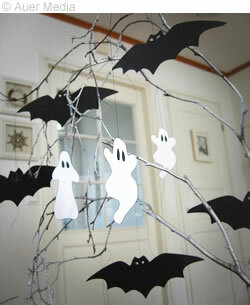 - Print the ghosts and the bat template on white paper. - Cut out the ghosts. - Cut out the bat template and use it to draw bats on black card. - Cut out the bats. - Make bat eyes with glitterglue or gel pen. - Tape a thread to each bat and each ghost and hang them up around the twig. 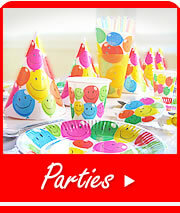 - You can use the same bat template to make invitations to your Halloween party.